All PV FIT solar energy systems now come with greater peace of mind due to a 5 year independent insurance backed guarantee covering your whole solar PV installation. With the launch of the governments solar feed in tariff (FIT) scheme in April 2010 solar photovoltaic systems offer very attractive investment propositions in today’s financial markets. FITs pay an above market rate for every kWh (unit) of renewable electricity you generate at home, or work, which is index linked to Retail Price Index (RPI) and government guaranteed for 25 years. Solar energy systems installed by homeowners also benefit on no tax being chargeable on any earnings from the scheme. Coupled with ever rising fuel prices no wonder solar power is the fastest growing renewable source of energy in the UK today! Despite the high uptake and reducing cost of equipment, a typical solar photovoltaic system (10-16 panels) will still set you back between £9-13,000 including 5% VAT. This means installing PV is the next most expensive purchase to a house, or car. PV FIT recognise this and are pleased to confirm that all new installations now come with an independent insurance backed guarantee covering deposits and workmanship as standard, without any additional cost to you. Independent Warranty Association (IWA), whom are Financial Services Authority approved providers of insurance, offer a comprehensive service whereby they assess prospective member companies against a strict set of financial, service, quality and customer satisfaction. Only on passing IWA’s audit can solar installation companies become members and offer their “Deposit and Guarantee Insurance” product. We will be shortly posting a specimen policy which outlines full T&C’s onto our Solar Warranty page. In addition to the workmanship guarantees all the products we offer also come with manufacturers warranties. We ensure that all equipment is manufactured, or if not the company have a significant presence, within the EU by suppliers whom offer the best quality product and service. As our 5 year insurance backed guarantee is workmanship based we do recommend that you contact your building and contents insurer to get cover the your PV FIT installation against fire, theft, etc. To get a free solar survey and for more information on costs, equipment and the installation process visit www.pvfit.co.uk or call us on *0344 567 9032. Are you a homeowner with some spare cash? A 20%-25% collapse in the price of rooftop solar power units in recent months has turned the government’s feed-in tariff scheme into one of the most lucrative financial propositions for households with the right sort of property. 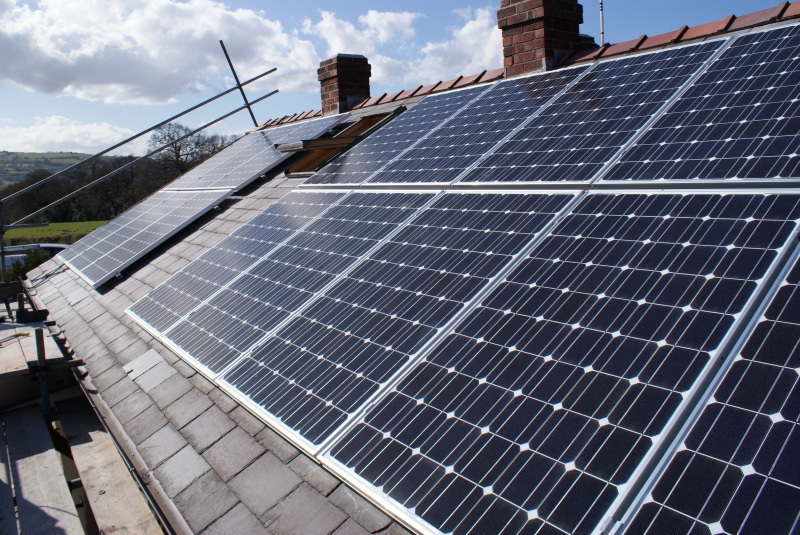 The scheme was introduced in April 2010, when the Labour government introduced generous feed-in tariffs to encourage households to install solar photovoltaic systems. Back then, anyone spending, say, £13,000 up front to fit a 2.5kWp system to their home was paid 41.3p per kilowatt hour (kWh) generated – enough to earn them a typical annual income of £900 a year in payments, on top of a £140-a-year saving in reduced electricity bills. t was described as a good investment because payments for each unit of electricity generated were guaranteed for 25 years, paid tax-free, and set to rise each year in line with inflation. If you were planning to stay in your home and had a suitable roof (unshaded, at a pitch of about 40 degrees, and facing between south-east and south-west), the main question was how big a system to install – assuming you could raise the installation costs. The bigger the system, the greater the financial return. However, you shouldn’t worry if you put off doing anything because it has emerged this week that waiting has worked in your favour. Solar experts say that as a result of the installation costs coming down, the investment value of the scheme has become even better. These lower installation costs, an inflation-linked increase to the feed-in tariff payments and the prospect of rising electricity prices all mean the guaranteed returns are now above 10% a year, depending on how you calculate it. And if you install before next April – when new payment tariffs look set to come into force – you are guaranteed the tariffs for the next 25 years at the old rate. David Houston, Managing Director of Chester based PV FIT, says that “costs of solar panels have dropped dramatically since April 2010 when the feed in tariffs were launched. A year ago we were installing a 4kWp system for £15-16,000 however now we are less than £13,000 including VAT. This means a potential return on investment of 13% per year!”. The fall in costs can be attributed to higher volumes of solar panels being installed in the UK, as well as falling tariff levels in Germany. One solar expert suggests that PV manufacturers set their prices according to the level of subsidy available. 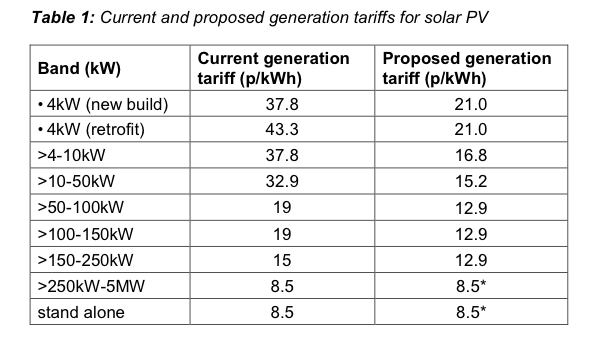 Feed in tariff levels are not likely to remain as generous, with tariffs due to drop by 9% or more as of April 2012 to counteract the dramatic cost reductions seen to date. Houston goes on to say “having been involved in the solar energy industry since 2003 I am used to seeing government tampering with incentives if they are seen to be too popular, or generous. We have recently seen the coalition implement a ‘fast-track review of feed in tariffs for larger scale installations’ (above 50kW), so there is no guarantee that smaller scale systems will not be put under the microscope before the end of 2011″. The one guarantee is that existing solar installations will not be affected, with any changes only affecting new adopters. This will mean there will likely be a ‘solar gold rush’ with prospective solar generators rushing to install a photovoltaic system before any FIT reduction comes into effect. 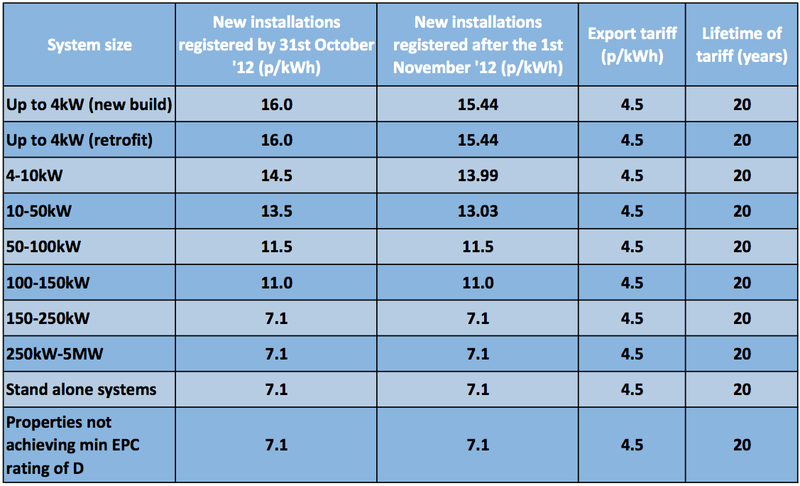 “The current number of solar installations in the UK to date is only the tip of the iceberg. There are a vast number of residential and commercial roofs that are suitable for solar energy systems up to 50kW. The potential for growth in employment and manufacture are astronomical due to solar being one of the easiest renewable retrofits available as it inhabits your roof rather than your rooms. In addition, fuel prices are only going to continue rising based on 2 of the ‘bog six’ raising their prices for electricity by as much as 16% recently” says Houston. PV FIT offer a free no-obligation solar survey over the phone after which you will receive a formal fixed price quotation via email. Just call 0344 567 9032 or request a solar survey to find out how much you can earn from feed in tariffs.